One of the many bird species tracked on Signals of Spring this season, is the Surf Scoter, also known as a seaduck. Our collaborating partner, Susan Wainwright-De La Cruz, a wildlife biologist from the USGS San Francisco Bay Estuary Field Station, explains that the tracking can help scientists to understand whether contaminants from San Francisco Bay are being carried to the birds breeding grounds. In general, very little is known about Surf Scoters, and by satellite-marking them, researchers can learn about their migration timing and routes, important migration stopover sites, and their breeding ground distribution. Matt Wilson, a biologist at the field station, is using these marked birds to try to understand what breeding habitat characteristics are important. Other collaborators are using birds marked in San Francisco Bay to look at spring migration stopover habitats. Since the gold rush, San Francisco Bay has been contaminated with heavy metals such as mercury. Mercury has historically been mined in the coastal mountains of California and collects in the soil. It still washes into the bay during rainstorms. Once in the Bay, mercury enters the food chain. Filter feeders such as clams, mussels, and other invertebrates take in the mercury and it stays within their bodies. Unfortunately, these mollusks are a common winter food source for the Surf Scoters, and when eaten, the mercury goes into the birds, and remains in their bodies. Mercury is a poison. In people, mercury poisoning can affect the nervous system, causing personality changes and memory loss. If a pregnant mother is exposed, the baby is often born with birth defects such as retardation and poor muscle tone. 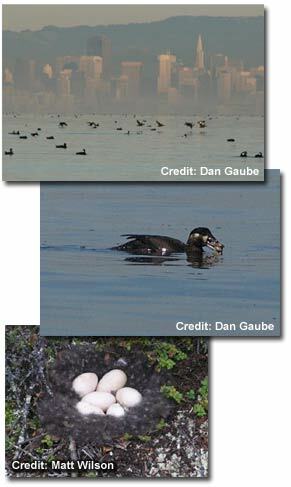 Similarly, exposed Surf Scoter hens can transfer the poison to their eggs. If scoter ducklings are exposed to mercury, they could have similar problems. According to Susan Wainwright-De La Cruz, "These ducklings could exhibit behavioral abnormalitiesthey might be less likely to fledge, forage for certain prey, or have a slower response to predators. The good news," she adds, "is that a study shows that the concentrations of mercury in scoters wintering in the Bay have gone down since the 80´s." By tracking the birds by satellite, scientists can follow them to their breeding grounds in Alaska and the Northwest Territories. There, the researchers test the Scoter eggs for contaminants such as mercury as well as for specific nutrients like carbon or nitrogen. If there are contaminants in the scoter eggs we find, this will help determine if scoters accumulated these contaminants in saltwater wintering habitats, or freshwater breeding habitats. The nests are hard to find; Surf Scoters typically don't nest in colonies, but tend to disperse and spread out on the breeding grounds. Satellite tagging helps scientists to find the nests. In addition to satellite tags, some birds are outfitted with radio tags. To find these birds, the scientists 'listen' for them, usually beginning in areas where satellite tagged birds have been tracked. Get ready for these birds to fly! Susan Wainwright-De La Cruz advises Signals of Spring students to expect the Surf Scoters to take off to the breeding grounds sometime between late March and late April, depending on the individual. She explains that it normally takes approximately 2 weeks to 2 months for the birds to make the trip. As you study the birds' movements, consider the land habitatsvegetation, geography, etc., because scientists still know little about why Surf Scoters select certain places to nest.